Pomade, powder, a pad, and a liberal dose of hairspray got me closer to Big Hair than I’ve ever been. A gown is one thing, but what about the rest of the ensemble? The Widow Costard print provided some guidance, despite being some years later than 1777. The black hood and cloak or mantelet over a white cap appears in other widows’ portraits, although the black silk cloak is not an uncommon accessory. I had been toying with making one already, and had patterned one from the original in Costume Close Up; extant examples aren’t thick on the ground, but there are enough to demonstrate some consistencies. 1760s example at the Victoria and Albert has a shape similar to that in the Williamsburg Collection, while another at the Met (dated, without a reason cited, to 1820-1829; perhaps the reason is in the selvage or the lace), provides some clues to construction and materials. So, with another remnant from the SFR in hand, I worked from my muslin to a paper pattern, using the neck cutout from my red wool short cloak as an additional guide. 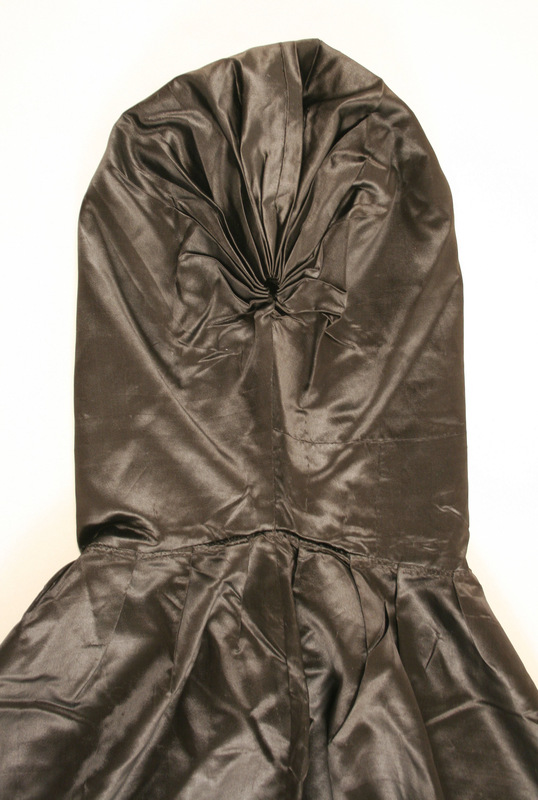 It went together in fairly short order, since it is mostly hemming, with just two seams and some pleating. While I wore it untrimmed due to time constraints, self trim or lace or would be ideal additions. Portrait of a Woman called Lady Fawkener ca. 1760. Jean-Etienne Liotard. 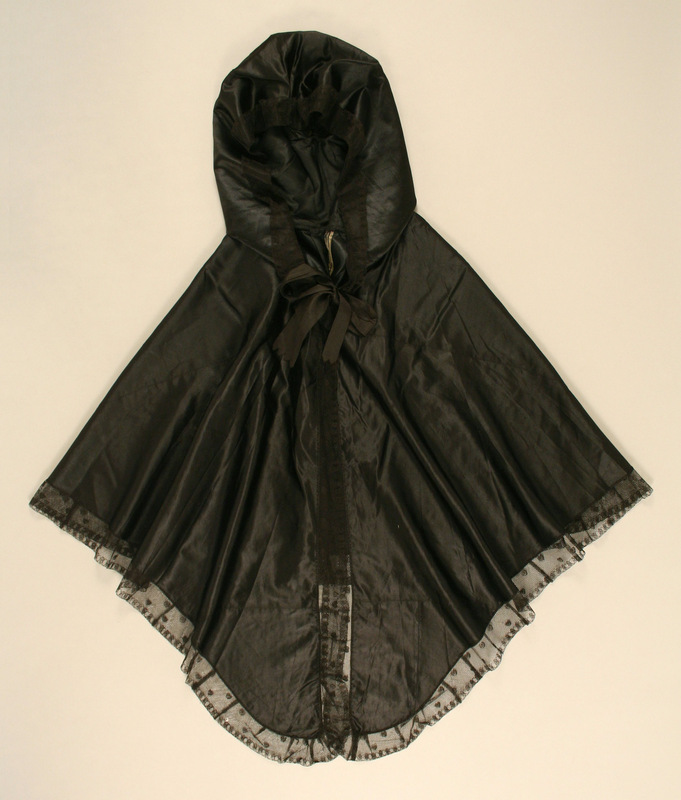 Additional clues to Elizabeth Weed’s status as a six-months widow are found in the black silk ribbon of her cap; black and white hats are common enough that the hat alone does not signal “widow.” I chose to make mine from a black figured silk taffeta lined with white, based on an ad in a Philadelphia paper. On October 15, 1776, John Brown advertised in the Pennsylvania Evening Post for a runaway Irish servant girl, Judith Kennedy, wearing, among other items, a “black spotted silk bonnet lined with white.” Obviously, this might well mean “bonnet” in the form we are most familiar with, and I have taken liberties by extrapolating the spotted silk to my hat cover. Nonetheless, black and white hats are a thing, and I was looking to upgrade from my tatty and faded black chip hat. Gathering white linen evenly is a challenge: literal thread counting. Gown, hat, cloak, updated caps: so far, so good. 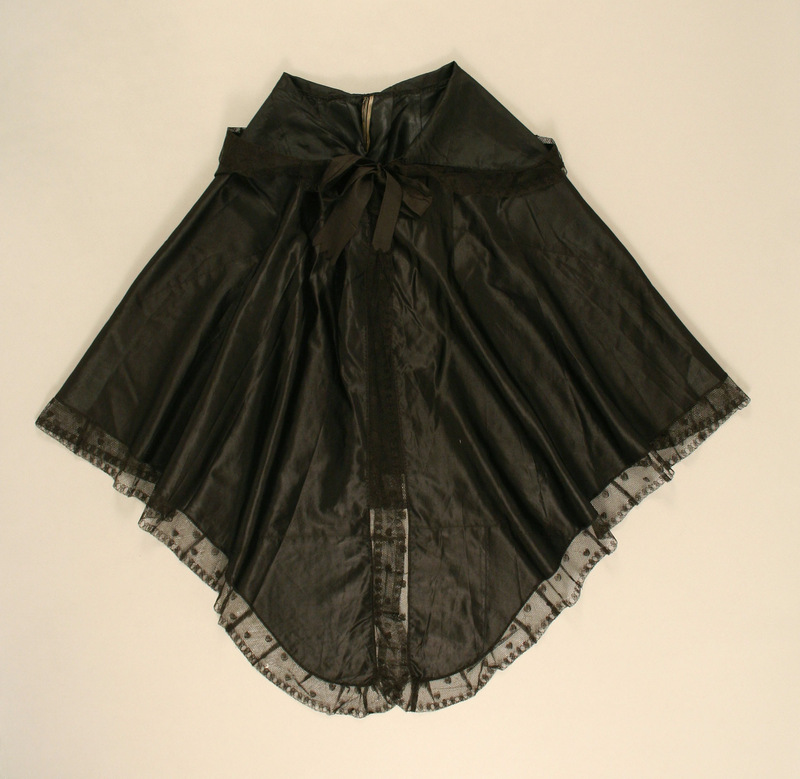 I had a black wool petticoat already, suitable for mid-Atlantic autumn (there was no way a black silk quilted petticoat was happening in the time allotted), and black worsted (woven) mitts. What else would Mrs. Weed need? Upgraded shoes are tempting but beyond my budget, so the last article of clothing was an apron. The majority of my aprons are check linen, with one clean unbleached linen apron and one stained white linen apron (coffee is my weakness). Fortunately, I found 30 yards of vintage white linen on a trip to New England, and thus had apron fabric handy. After making five aprons, this one went together in less than a day. The final piece was jewelry. A few years ago I found a “Georgian” cut steel and glass locket suitable for hair that I wore as a widowed housekeeper; on a fresh black silk ribbon, that would be a cornerstone. I added a three-strand necklace of black glass beads to contrast with the locket (thanks to the local hobby store and a stash of findings). Earrings also came from the stash, made up quickly from modified buttons and black faceted drops. Accessories. I finally have them. I added a white silk neck-handkerchief for warmth, and bought a black one just in case. Based on images, I thought white most appropriate, but somehow, with the grey gown, the image of “Pilgrim” was hard for some visitors to overcome, so on Sunday, I switched to black. Sometimes you have to choose accessories to lower the hurdles for your audience. Explaining that I was not a Pilgrim, but in mourning–while providing an opportunity for interpretation–was not my primary objective, so the easy color switch seemed well worth making. The remedies (as promised) were another, slightly strickier matter. While making them according to the receipts I found was relatively simple– this is long before big pharma– carrying them was another challenge. I opted to make a box, and fill some bottles, as will become plain in the next installment.